Israel’s ambassador to Budapest issued a sharply-worded statement, following a bizarre and vicious display of overt antisemitism in the town of Érpatak, located in the northeastern county of Szabolcs-Szatmár-Bereg. The town’s far-right mayor, Mihály Zoltán Orosz, organized a mock, public execution (which Ambassador Ilan Mor referred to as a “horror show”), where effigies of Israeli Prime Minister Benjamin Netanyahu and former President Shimon Peres were hanged. During the symbolic hanging, Mr. Orosz referred to Israel as a “terror state” and noted that people in Hungary and elsewhere must fight “the efforts of Freemason Jews to rule the world.” Mr. Orosz’s event was intended to serve as a protest in solidarity with Palestinians in Gaza, but ended up being a rabidly antisemitic and bizarrely atavistic display, involving a man dressed in a black hood, serving as the executioner, who was in charge of hanging Mr. Netanyahu and Mr. Peres in effigy. Mr. Orosz also waved a modified Israeli flag, which included the Freemason symbol and skinheads stood in the background. “Israel, as a democratic country, respects the right to free expression and freedom of assembly, but will never accept actions and phrases, as witnessed in Érpatak, that are anti-Jewish, racist, xenophobic and that promote and call for the murder of other people. A very dangerous line has been crossed. Words can kill. The Government of Hungary must act to stop these dangerous acts. I am certain that very soon, in accordance with Hungarian law, authorities will investigate what transpired in Érpatak. 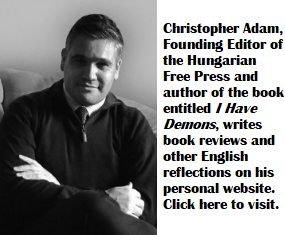 I know that the majority of the Hungarian population uniformly rejects and condemns these terrible, abusive and vile words and deeds”–added Ambassador Mor. 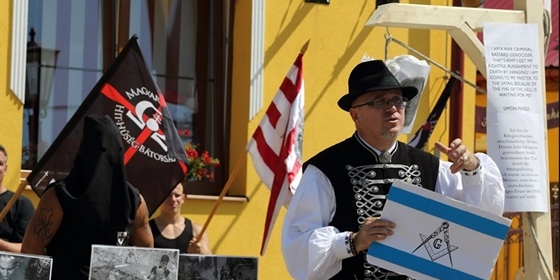 This is not the first time that Mayor Orosz, who is affiliated with the fascistic Jobbik party, takes to the streets with displays and actions that are meant to instill fear. In June, the mayor and his supporters held another mock execution, in the regional urban centre of Nyíregyháza, in which a local prosecutor and judge were hanged in effigy. “We will make them taste the fires of hell, which will await them after their death, for all their ruinous and anti-national activities,” noted Mr. Orosz. Last fall, the mayor’s supporters also marched with torches to the home of a prominent liberal activist, and verbally abused him. The torches burning in the night reminded pro-government blogger Gellért Rajcsányi of the Ku-Klux-Klan’s cross burnings. It is more than antisemitism. The result will be dramatic and brutal to the Hungarians. This nation is just teaching the world how to handle them Hungarians and are heading for their own extinction. They do not seem to understand it yet.